Are you looking to do more to support Hearing Health Foundation's critical hearing loss research and awareness programs? You don't have to do it alone! Inspire your community—your friends, family, neighbors, colleagues, or classmates—to give on your behalf as an HHF Community Fundraiser. Become an HHF Community Fundraiser on Facebook or Classy. Both platforms are simple and secure and can provide support for our shared goal of permanently curing hearing loss and tinnitus. SELECT A platform below to get started. If you wish to make an individual contribution instead of or in addition to creating a fundraiser, you may do so here. Create a powerful Facebook fundraiser with our Guide. Step 1: Access. Visit the fundraising section of HHF's Facebook page. Step 2: Start. Click the "Raise Money" button in the center (on mobile) or on the right (on desktop). Step 3: Choose your fundraising goal. The default value is $200 USD, but no goal is too big or too small! 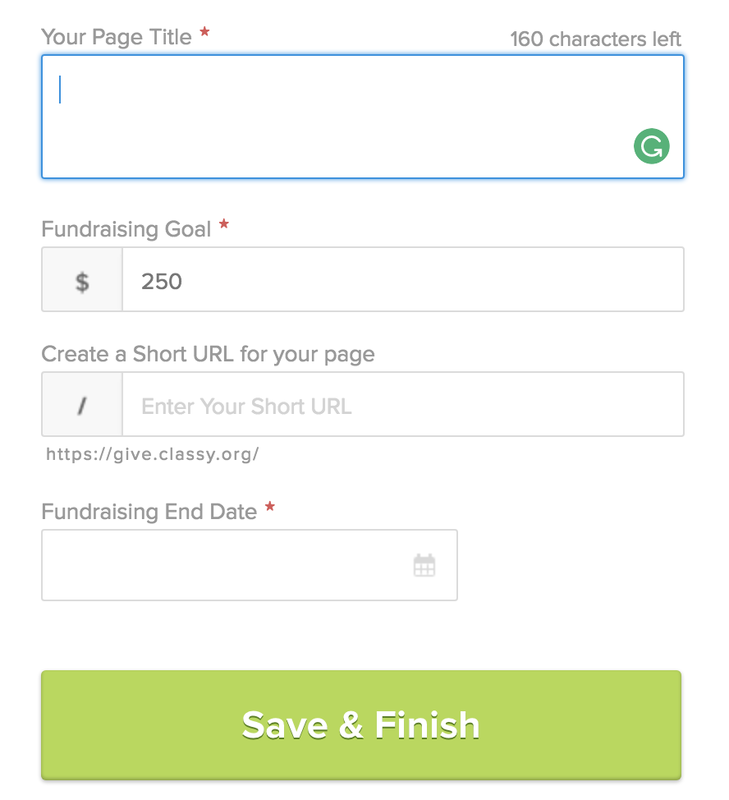 Step 4: Choose your fundraiser length. The default length is two weeks, but we suggest extending to three weeks or longer. You can align your fundraiser's end-date with a holiday, your birthday, the birthday of a loved one, or another special occasion. Note: You can adjust the fundraiser end-date at any time. Help [Your Name] Cure Hearing Loss and Tinnitus—Permanently! 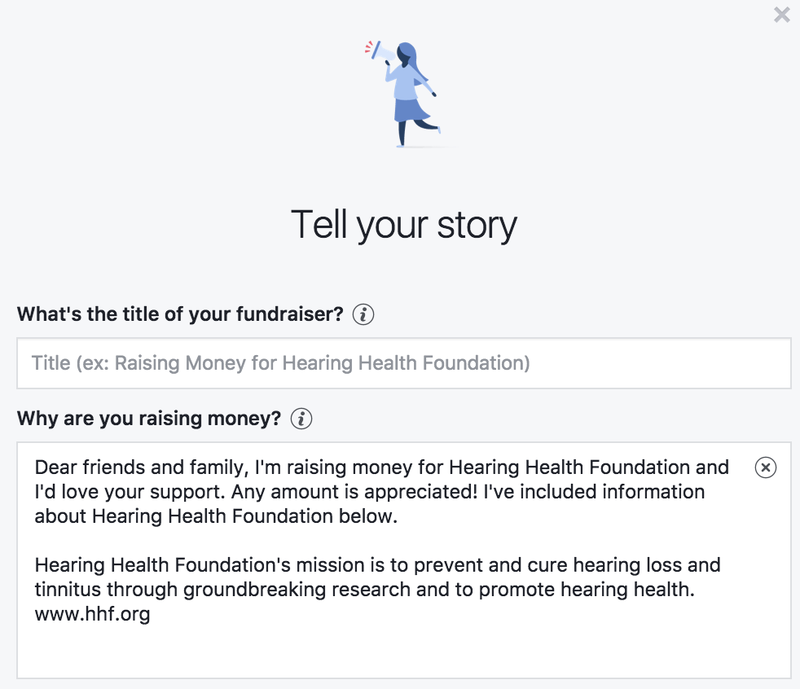 Also feel free to use the default title, [Your Name]'s fundraiser for Hearing Health Foundation. Step 6: Tell Your Story. Why are you raising money? Do you have hearing loss? Tinnitus? Hyperacusis? Ménière's disease? Central auditory processing disorder? Usher syndrome? Do you know someone who suffers from one of these conditions: your child, parent, grandparent, aunt, uncle, cousin, sibling, friend? Did you recently lose a loved one who had a hearing and balance disorder? Are you a military veteran, aware that tinnitus and hearing loss are the number one and number two war wounds, respectively? You story is unique and your community will be most inclined to give when they read something that is personal to you. Consider adding information about the above to the default text, which contains a summary of HHF and the website URL. Step 7: Choose a photo. Our Facebook page's cover photo will appear by default. If you don't think it's a good fit, upload your own photo, or click here to use one of ours. Step 8: Publish your fundraiser. It's now live! Remember, only friends on Facebook can give to your cause. Step 9: Promote your fundraiser. Setting up a page is a great first step, but reaching your goal will be difficult unless you get the word out. Share the fundraiser to your timeline periodically. Emphasize how close you are to (or how far away from!) reaching your goal. Invite those most likely to give. Think about who you are Facebook friends with and who the cause would resonate with most. Email the fundraiser to your friends who use Facebook less often. You can copy and paste the URL (website link) from the bar at the top of the browser screen and send it to them. Step 10: When your fundraiser ends, say thank you to your contributors. CREATE A POWERFUL CLASSY FUNDRAISER WITH OUR GUIDE. Step 1: Access. Go to HHF's main fundraiser page on Classy. Step 2: Choose an occasion. Classy will prompt you to specify if you are fundraising for a specific reason, like a Birthday, a Holiday, or In Honor Of a loved one. Each choice permits the same level of customization for your personal page. Step 3: Create an Account or log in if you already have one. Step 4: Define the basics. A pop-up box will ask for the most basic information about your fundraiser. Fundraising Goal: The default value is $250 USD, but no goal is too big or too small! URL for your page. Make it relevant to your name and/or your fundraiser title. End Date: We suggest running your Classy fundraiser for at least three weeks. Step 5: Fundraiser Photo or Video. Upload your own photo or video or click here to use one of ours. Step 6: Profile Photo. Upload a photo of yourself or a loved one to further personalize your Classy page. Step 7: Personalize Your Message. Why are you raising money? Do you have hearing loss? Tinnitus? Hyperacusis? Ménière's disease? Central auditory processing disorder? Usher syndrome? Do you know someone who suffers from one of these conditions: your child, parent, grandparent, aunt, uncle, cousin, sibling, friend? Did you recently lose a loved one who had hearing loss or a related condition? Are you a military veteran, aware that tinnitus and hearing loss are the number one and number two war wounds, respectively? Your story is unique and your community will be most inclined to give when they read something that is personal to you. Step 8: Personalize Your Thank You Email to Donors. Classy conveniently sends emails on your behalf. Write something nice to make your donor feel extra special about having given to your fundraiser. Step 9: Click Update and Promote. Once all essential information has been input, hit "Update" at the bottom of the screen. Then, begin sharing your fundraiser with friends via social media and/or email to get the word out. IMAGES: CLICK TO OPEN IN NEW WINDOW. RIGHT CLICK TO DOWNLOAD & SAVE.